Viktor Burlaka received his Joint Ph.D. in Social Work and Clinical Psychology in 2015 from the University of Michigan. 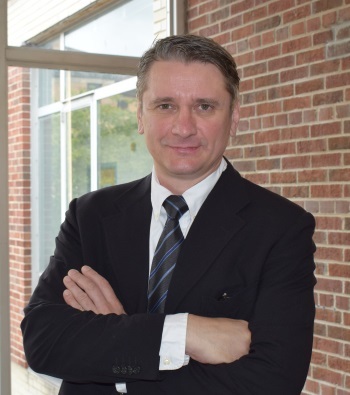 He has been engaged in best practice and policy development in human services since the mid-1990s, serving as organizational development consultant and team leader on multiple capacity-building projects in Eastern Europe and Central Asia. His ongoing professional focus involves capacity building for substance abuse research and connecting applied research to the implementation of best practices to improve the lives of children and families in the United States and globally. As an assistant professor of social work at the University of Mississippi between 2015 and 2018, Burlaka was immersed in teaching and research on clinical practice, program evaluation, capacity-building research, evidence-based and implementation science in the area of child welfare, family services, mental health, violence, and substance abuse. Burlaka received his M.S.W. in 2003 from the Kyiv-Mohyla Academy, Ukraine and is a Licensed Clinical and Macro Social Worker in Michigan. He provided clinical interventions to the vulnerable children and families as well as implemented community-based programs. These programs target typical problem areas related to child protective services, such as child maltreatment, substance abuse prevention, and intimate partner violence. Burlaka was engaged in the evaluation of mental health practices in Michigan and in Mississippi and was among core researchers leading the collaboration between the University of Mississippi and the Mississippi Department of Child Protection Services, serving as director of evaluation and co-principal investigator for the Child Welfare Training Academy that provided training for all newly employed child welfare workers in the state. Using in-depth mixed methods research with hundreds of newly employed workers, he explored organizational climate, knowledge translation and sustainability as well as organizational barriers that get in the way of best practices in Mississippi. Burlaka is regularly invited to provide continuing education and training to clinical social workers and child welfare workers. He has published in leading social work and psychology peer-reviewed journals, edited a number of books, and presented at numerous national and international professional social work and psychology meetings. Multiple factors such as childhood experiences of trauma, low income, mental health and substance abuse can influence students’ professional choices and their ability to focus on studies. In this study, we plan to use longitudinal data to examine the impact of numerous risk and protective factors associated with academic and personal success among students in Mississippi. The present study stems from the Mississippi student success study and examines similar constructs. The study aims to use the longitudinal design to examine whether the risk and protective factors have a similar influence on student success in the context of Ukraine as they do in the United States. Ukraine has some of the highest rates of substance use and co-occurring mental health disorders in the world. Very high suicide rates, HIV, and heart and liver diseases have also been linked with increased consumption of alcohol and drugs. The project, funded by the National Institutes of Health (NIH) Fogarty International Center (Zucker, PI, Walton, Co-PI), conducts yearly workshops in various sites in Ukraine to enhance knowledge of Ukrainian researchers about substance use disorder (SUD) developmental psychopathology, prevention and intervention strategies in non-clinical or community-based settings, and research methodology. The project also offers a year-long, mentored research fellowships at University of Michigan for Ukrainian post-doctoral fellows that end with the home-country research projects that each fellow develops while in the United States. Additionally, the project offers intermediate-term fellowships at U of M for mid-career Ukrainian substance abuse researchers to consult at U of M and NIH about future program directions. The project working group is also planning to implement a clinical trial on SUD screening and early intervention in targeted Ukrainian communities. Finally, the project aims to increase scientific collaboration between Ukrainian substance abuse researchers and international researchers.